TC Electronic have announced a new line of Mini TonePrint pedals reprising some TC classics in seemingly impossible compact designs. Thanks to the TonePrint editor TC are able to compress their pedal designs whilst still allowing the user to have control over the full parameters. These pedals look and sound great and will be a favourite squeeze amongst busy pedalboards. Our new line of Mini TonePrint Pedals may well come in seemingly impossible tiny packages, but Flashback Mini Delay, Corona Mini Chorus, Vortex Mini Flanger and Shaker Mini Vibrato all still house some of the best sounds around just like their bigger brothers – straight out of the box! Sporting full TonePrint functionality, these pedals also allow you to use tones customised by your favourite artists, including guitar legends such as John Petrucci, Guthrie Govan, Steve Morse, Lee Ritenour, Joe Perry and Paul Gilbert to name but a few! Plus all the pedals can also be totally customised via the free TonePrint Editor available for Mac, PC and iPad, which can turn the mini pedals into exactly how you want or need things to sound. True Bypass and Analog-Dry-Thru guarantee no tone coloration, zero latency and no conversion of the dry signal for absolute tonal transparency. 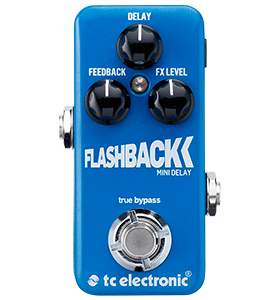 We’ve taken all that you know and love about TC delay sounds, and poured it into a footprint too good to be true. You get the most revered TC Electronic delay tones from tape to lo-fi to digital plus TonePrint, which turns this into a must-have delay in a miniature format. From subtle swells to full-on Leslie sounds, the classic TC Electronic SCF sound plus a huge sounding TriChorus and infinitely more in a tiny pedal. 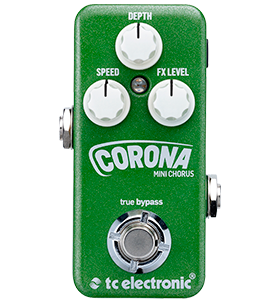 No matter what your chorus-needs may be, it can be found here- in a pedal that takes up next to no space on your pedalboard! 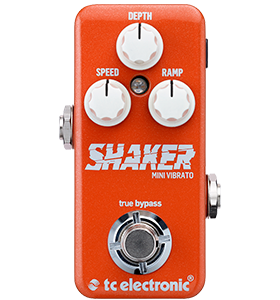 The full sized Shaker Vibrato has been the sleeper hit of the TonePrint series. Guitarists love adding the life and vibe of both subtle and pronounced vibrato effects – and Shaker Mini Vibrato translates that winner combo perfectly to the mini realm. 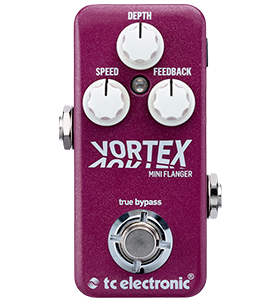 Vortex Mini Flanger combines a classic tape flange with a through-zero mode. Plus of course the TonePrint technology grants access to everything from 747 jet flanges to customised rockstar sounds! All pedals are due to arrive sometime next week.